Bone Conduction Speakers | OhGizmo! If it ain’t good enough to have just a rear view mirror in your motorcycle helmet, well now you can have speakers too. 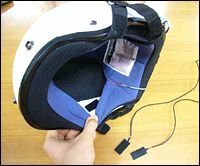 Software developer Nippon MMI Technology Inc. has designed a bone conduction speaker that is now safe enough to place in your helmet. Previous in helmet speakers had never met safety standards due to their coil and magnet design. Nippon’s speaker system uses piezoelectric ceramic which is apparently soft enough to not cause damage to your head in case of impact. The speaker system will run about $50, but is only available in Japan and South Korea. Nippon is in talks to bring the product to the US sometime soon. mine involved a wireless tooth/jaw implant. I’m not worried though. it’s bound to be developing somewhere.